SEPTEMBER 10, 2018 – Venice, FL – Single tickets for The Venice Symphony’s 45th “Sapphire” Season, led by new Music Director/Conductor Troy Quinn, are on sale to the public. The season runs from November 2018 to May 2019 and all concerts take place at the Venice Performing Arts Center at One Indian Ave., Venice. 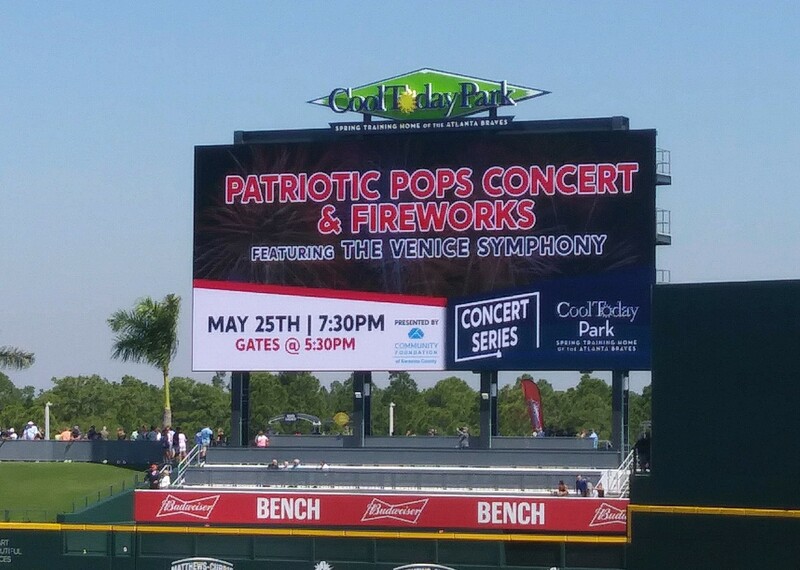 Tickets can be purchased online at TheVeniceSymphony.org, by calling 941-207-8822 or at The Symphony Office, 10 am to 4 pm Monday – Friday at 1515 S Tamiami Trail, Suite 7, Venice, 34285. Season subscriptions and packages of four or more concerts are still available. Season concert sponsors are Gulf Coast Community Foundation and the Tourist Development Council of Sarasota County. Season Media Sponsor is WUSF. In the 2017-18 “Finding Maestro” season, seven finalists for the conductor position led the orchestra. Troy Quinn, who led the May concert, was named Maestro, in June. Maestro Quinn promises “a bold and exciting season,” of masterworks, classical favorites, pops and film music. This season, The Venice Symphony has introduced a Saturday Evening Pops package, offering a 15% discount on tickets to the December 15 Holiday Pops and the February 2, Rhapsody in Blue 7:30 pm concerts. Parking is free and a low-cost valet service is available. Tickets start at $25. Student tickets are half-price. Group discounts are available. Season subscriptions and packages of four or more concerts are available now. Again this year, Bank of America will sponsor our free Pre-Concert Meet the Maestro and Guests Talks, 6:15 pm before evening concerts and 2:15 pm before afternoon concerts. No ticket or reservation is required. To celebrate its 45th anniversary and its new Maestro, The Venice Symphony will hold a Sapphire Gala, 6:30 pm, November 10 at the Venetian Golf Club in North Venice. Highlights of the evening include dinner, music all evening by Venice Symphony musicians, an open bar, live auction and a visual history of The Symphony. For tickets and details, call 941-207-8822. Festive Overture, op.96 by Dimitri Shostakovich, Ottorino Respighi’s Fountains of Rome and Pines of Rome; Carnival of Venice featuring The Venice Symphony’s Aaron Romm on Cornet. Concertmaster Marcus Ratzenboeck solos on Saint-Saens’ Introduction and Rondo Capriccioso, op. 28. Steven Jarvi, guest conductor in February 2018, will lead the orchestra for a concert featuring a mix of seasonal music including selections from The Nutcracker, Brazilian Sleigh Bells, Feliz Navidad, a holiday sing-along and more. Guest Soprano Soloist Johanna Fincher. Felix Mendelssohn’s Nocturne, Wedding March from a Midsummer’s Night’s Dream, Richard Strauss’s Till Eulenspiegel’s Merry Pranks. Award-winning Pianist Andrew Tyson will solo on Robert Schumann’s Piano Concerto, Op. 54. The finale is William Walton’s Suite from Henry V.
Beethoven’s Symphony No. 7, Rossini’s Overture to La gazza ladra. Venice Symphony Principal Cello Scott Crowley solos on Saint-Saens’s Concerto for Cello No. 1, op. 33. Mozart’s exhilarating Symphony no. 41, (Jupiter), is the composer’s final symphony. The second half of the concert is dedicated to Mahler’s spellbinding Symphony No. 1, D Major (Titan). Inspirational music of Duke Ellington, Aaron Copland, Leonard Bernstein, Stephen Foster, John Williams and more. Concertmaster Marcus Ratzenboeck is soloist on Ashokan Farewell and Sweet Georgia Brown. For high-resolution images or to request interviews, please contact Sharyn Lonsdale. About The Venice Symphony: Founded in 1974, The Venice Symphony is a 501 (c)(3) professional orchestra deeply rooted in its community, offering a variety of concerts from November through May, special events and long-standing music education programs for youth and adults throughout the year. The Venice Symphony is a member of the League of American Orchestras.